Objects kept inside a museum, displayed in a beautiful or artful way, can only be looked at from a distance : the whole point is to keep precious and valuable objects safe from harm. Yet when one actually touches material culture, there is a spark of communication which leads towards to a whole new way of seeing things. organized for the students of Prof. Anne Gerritsen’s MA course – The Material Culture of Food and Drink: Interaction and Exchange between Asia and Europe. After a tour of the Prinsenhof Museum on that sunny morning in the town of Delft, students were split into small groups and each given a crate filled with pot shards and broken vases, to disseminate their origins and functions. Small Chinese wine cups of delicate porcelain with shiny glaze, sturdy Dutch cooking pots of dark earthenware, a small bowl inscribed ‘Dit is Jan’s kommetje’ – a child’s porridge bowl?- and of course lots of Delftware in blue and white: we were allowed to touch everything, and were made to reflect on the use of these objects in relation to food and drink. 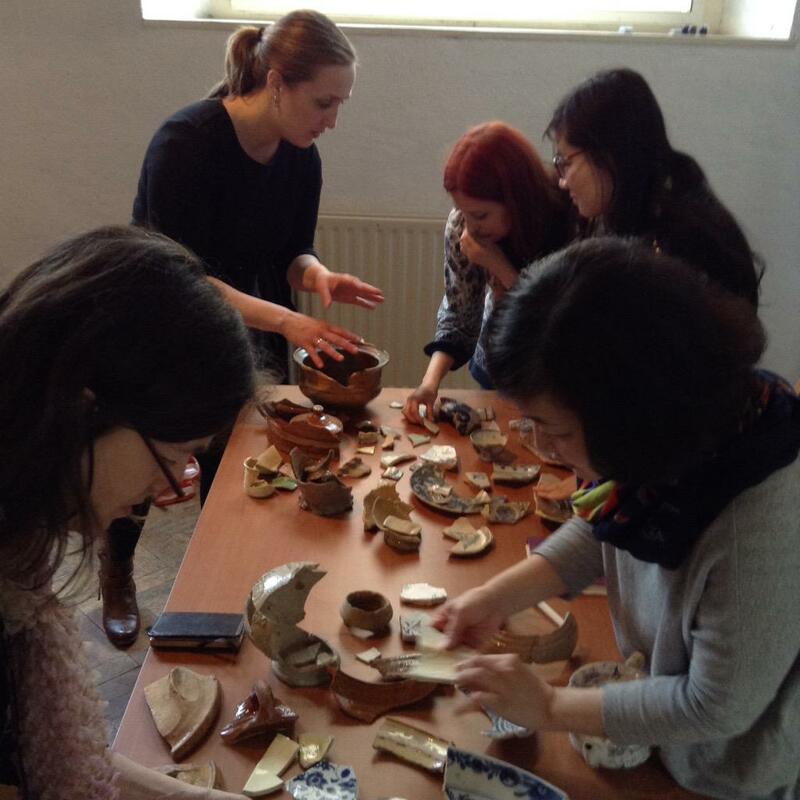 Handling these various ceramic objects, feeling the sharp edged shards and the shiny surfaces, brought the material culture of food and drink to life in a very direct way – and led to many interesting discussions during the session. Thanks again, Susanne Klüver, for having us! By kattebelletje in blog on June 4, 2015 .